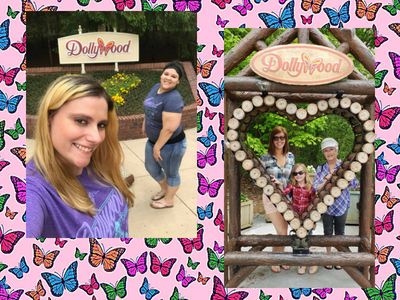 Follow the butterfly road: a day to frolic at Dollywood Clogging Classic 2018! Registration for the Dollywood Clogging Classic includes admission into the park for both Saturday and Sunday at a very reasonable price. Since Saturday competition was devoted to Amateur categories, Fancy Free Cloggers had a full day to roam the park! One caveat: Laying out your tickets and then forgetting to grab them on the way out the door gets you a longer scenic drive. Ask Dustin about that, ha-ha! At least he realized it before he actually arrived at Dollywood. His family might have thrown him into Doggywood at that point... Not a terrible punishment, really; Doggywood looks adorable! Most of us started off the day with a stack of pancakes because that's what you do in Pigeon Forge. May as well make a stop at Three Bears General Store along the way to see this giant bear and a live one or two! 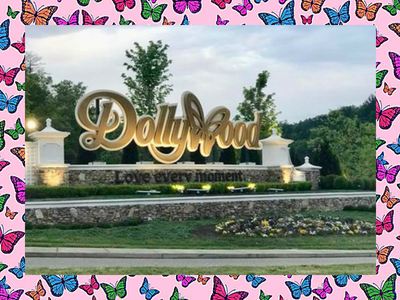 As you approach Dollywood, the lanes really are marked by butterflies. The parking sections utilize helpful mnemonics (lot D/E is called "Dolly's Earrings") to prevent confused passengers aimlessly riding the tram all evening. 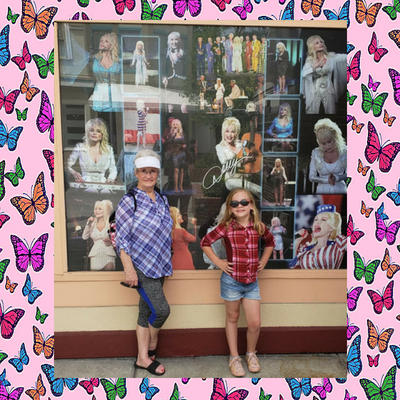 Photo ops abound all over Dollywood. Pick your favorite and strike a pose! After a check of the clogging theater (It was PACKED on Saturday! ), our roads diverged. Someone wisely set up a group Messenger chat for our team so all the coaster people could meet up. Above are the faces of brave/crazy cloggers after braving thrills such as the Lightning Rod and the Tennessee Tornado. You coaster folks can have your Wild Eagle ride; I got to see the real thing at Dolly's "Birds of Prey" show! This show also features owls, hawks, and vultures. All of the birds are disabled in some way that prevents them from being released back into the wild. This show gives the audience a rare close-up look at these amazing creatures. Some of them even fly over the audience! The photo didn't turn out so well, but those are a whole bunch of eagles just chillin' at Dollywood's Eagle Mountain Sanctuary, home to the largest group of non-releasable eagles in the world. Dollywood works in conjunction with the American Eagle Foundation to protect these birds. You can keep track of the Dollywood eagles after you return home via nest cams. You've gotta hand it to Dolly; she gets involved with wonderful causes! WE HAD AN ACTUAL DOLLY SIGHTING! She delighted her fans by riding through the park on Saturday afternoon, looking every bit the success story she is. You don't expect Dolly's personal parade route to be marked by regular caution tape, do you? Please! Best souvenir I didn't purchase: these adorable dancing chickens! Maybe next year. Dollywood's gift shops are fun to browse, with many in Craftsman's Valley offering demonstrations. No flash photography allowed inside, but I highly recommend the Chasing Rainbows Museum. It provides a chance to escape the heat or rain while you browse displays of old costumes, movie props, awards, and other memorabilia arranged in a way to tell Dolly's incredible story. Highlights include a welcome from a holographic Dolly and a replica of her original coat of many colors. Thank you to Fancy Free Cloggers, family, and friends for photos used in this post. Who else out there is a roller coaster nopester? Newer PostCheering for the "enemy": a great day of dance at Dollywood Clogging Classic 2018! 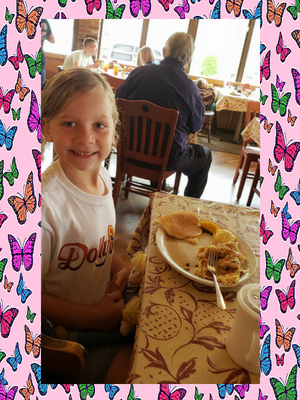 Older PostTurn left after the 385th Cracker Barrel: journey to Dollywood Clogging Classic 2018!